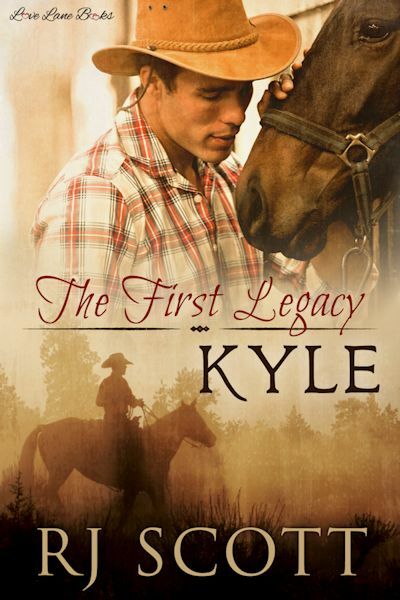 Today I’m excited to share my review of Kyle (Legacy #1) by RJ Scott. This was an emotional and touching journey of healing and love! I hope you’ll check it out and don’t forget about the awesome GIVEAWAY at the end of the post! Kyle is a powerful story about some very broken men! It’s a story more about healing and learning what love is more than it’s a romance. This is a touching book that made me feel so much for these characters. Kyle and Jason have led very abused and painful lives, they exist in a world where love doesn’t exist and no one is kind just to be kind, there is always a price. But, now they are Legacy Ranch, where Jack and Riley hope to show these damaged men that there is more to life, that people can be good. Kyle has been at the ranch for a bit, building the buildings and taking care of his horse, and more importantly trying to rebuild himself. He still looks at every man as someone he may have to take on, but he’s trying. Jason has lived on the streets, sold himself to survive and has seen death up close. He’s given an opportunity to be at the ranch and he believes it’s short lived, like everything else. Kyle and Jason have a slow build to friends at first, learning to trust each other, to not expect the absolute worst from each other. It builds beautifully though, each man coming to terms with their experiences and healing little by little together. The pain of their pasts still exists but together they seem to be able to learn there can be more for their future. This was not the easiest read, these two have been through so much and it shows and it broke my heart at times, but it was definitely worth it! I loved Kyle and Jason and was rooting for them the whole time – if two people deserve love it is these two. I loved seeing how, as their relationship grew, they were able to depend on each other and draw strength from each other. Overall, this was a very touching story focused more on the healing and finding that love. While there is pain and darkness in this story there are many more heartwarming moments as Kyle and Jason rebuild. There are also many other great characters that support Kyle and Jason on this journey as well. I really enjoyed this book, it definitely has a spot in my heart and cannot wait for more of this series! *I received a complimentary copy to review for The Geekery Book Review.